Beading Arts: Some local bead stores that readers want to shout about! Some local bead stores that readers want to shout about! One of the ones I used is The Bead Bin in Madison WI. Here’s the link to her site — just a gallery type of site – she doesn’t sell from it. And she has some pix of the store on there. The owner’s name is Chris. If you would like her email address please let me know. She has excellent staff who are able and willing to help customers also. We offer all the standered items softflex, wire, and beads! But what our new customers always comment on are…the seed bead selections(15/0 to 6/0), Pardo Clay, resin, unique beads, diffrent beads, lots of findings, Antique beads, glass beads, soldering tool, and great workshops… We also are growing and moving to support other crafts so mix media artist love us too. Plus we love what we do and believe we are here to support you! I love Creative Castle in Newbury Park, Southern California. There are a million wonderful beads and excellent classes with cutting edge instructors. What really shines about them is that the staff is kind, welcoming, knowledgeable and always willing to share information and help me with any “how to” questions. They give me good feedback and help me to be a better artist. We have a ton of beads store in NYC to choose from, but I have my favorites. I prefer these stores because the folks who work there/own them are always so pleasant and helpful. It may come as a shock, but not everyone in NYC is pleasant. My top 5 favorite places are: Empress Designs is close to where I work. They have a decent selection of beads and finished jewelry and they always say, “Hello friend!” when I come in. Located at 20 West 46th St, New York, NY 10036, (212) 575-6378 http://www.empress-jewelry.com/. The second store that is always, always pleasant to go to is Suma Beads Gems & Pearls located at 66 West 37th Street New York, NY 10018-7401,(212) 904-1690. They do not have a website, but the woman who works there is a sweetheart and they always have pearls on sale. The store I go to because it is just a pretty store with good selection of gemstones and they have some nice sales is Genuine Ten Ten located at 1012 Avenue of the Americas, New York, NY 10018 Phone: 212-221-1173 http://www.j-genuine.com/ For glass and quartz beads, I like Empire Bead: 1032 Avenue of the Americas New York, NY 10018-5493 (212) 768-8818. Fun 2 bead is great for artistic wire and their sale room! 1028 6th Avenue New York, NY 10018 (212) 302-3488 http://www.fun2bead.com/. 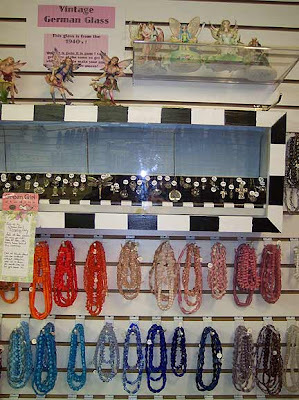 Hey Cyndi, I frequent a wonderful bead shop here in the Myrtle Beach area of South Carolina called Moonstone Beads. C.J. Peters is the owner. It is a wonderful place to go for beads, classes, inspiration, and exciting conversation about…beads! I have learned so much from this amazing group of ladies, especially Kira, her assistant. I have now become a volunteer with them, and have learned several new stitches. They are on Facebook, and their website is Moonstonebeads.com. Our favorite bead store is in East Rochester, NY. It's called Let's Bead! They have the latest & greatest styles and are always getting in the highest quality beads available. They also have some of the most talented jewelry designers working there and teaching classes. Come check out their site its www.letsbead.com!